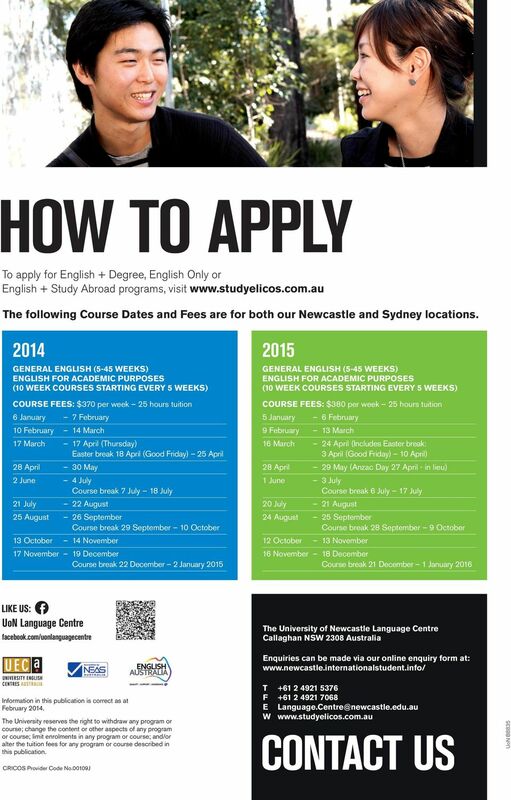 Download "English Language Courses Newcastle Sydney 2014/15"
3 Specialised global experience Programs We offer a wide range of specialised English programs for student, tourist, industry, educational institute and government groups or individuals who want to study English and experience Australian culture, or gain professional development. 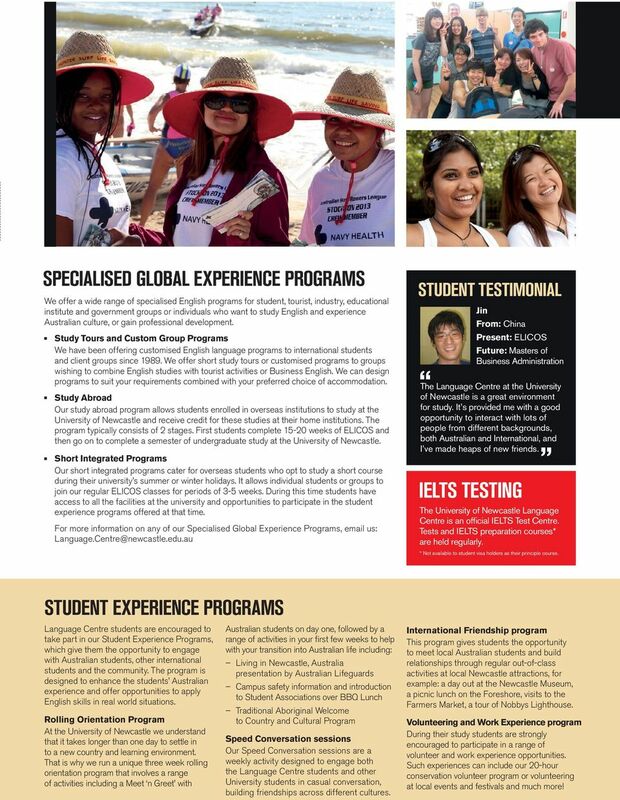 Study Tours and Custom Group Programs We have been offering customised English language programs to international students and client groups since We offer short study tours or customised programs to groups wishing to combine English studies with tourist activities or Business English. We can design programs to suit your requirements combined with your preferred choice of accommodation. Study Abroad Our study abroad program allows students enrolled in overseas institutions to study at the University of Newcastle and receive credit for these studies at their home institutions. The program typically consists of 2 stages. First students complete weeks of ELICOS and then go on to complete a semester of undergraduate study at the University of Newcastle. Short Integrated Programs Our short integrated programs cater for overseas students who opt to study a short course during their university s summer or winter holidays. It allows individual students or groups to join our regular ELICOS classes for periods of 3-5 weeks. During this time students have access to all the facilities at the university and opportunities to participate in the student experience programs offered at that time. 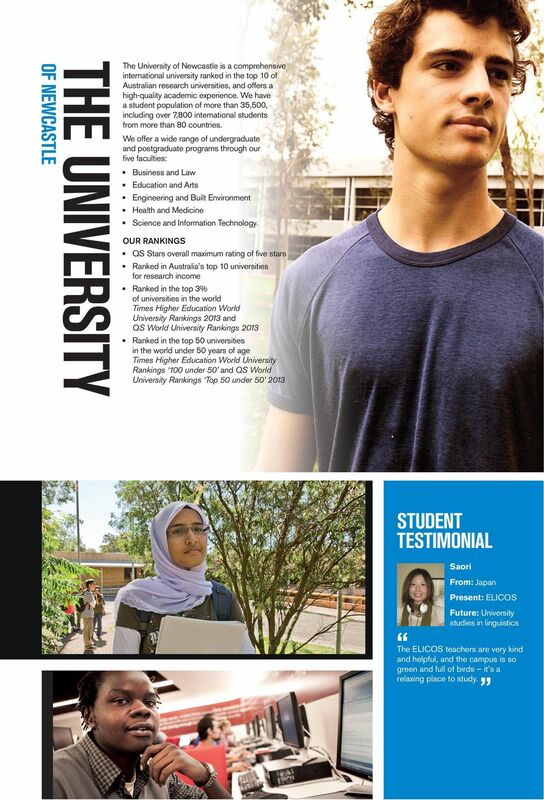 For more information on any of our Specialised Global Experience Programs, us: Student Testimonial Jin From: China Present: ELICOS Future: Masters of Business Administration The Language Centre at the University of Newcastle is a great environment for study. It s provided me with a good opportunity to interact with lots of people from different backgrounds, both Australian and International, and I ve made heaps of new friends. 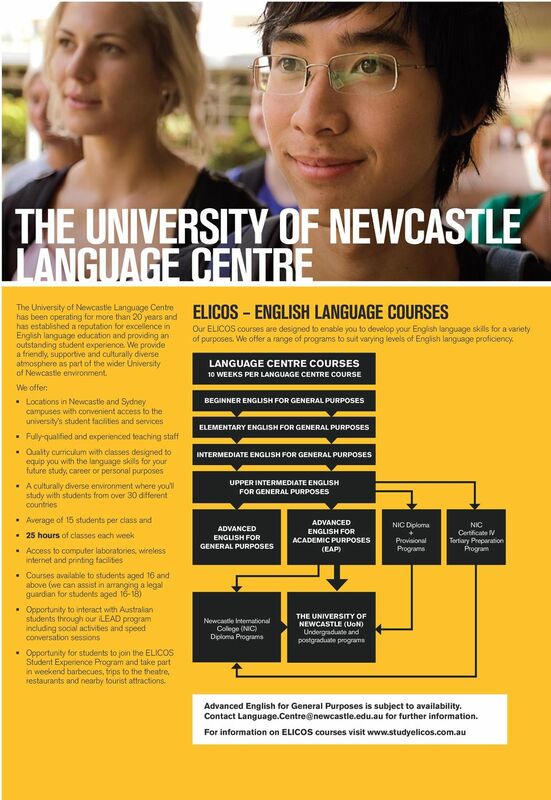 IELTS Testing The University of Newcastle Language Centre is an official IELTS Test Centre. Tests and IELTS preparation courses* are held regularly. * Not available to student visa holders as their principle course. Student Experience Programs Language Centre students are encouraged to take part in our Student Experience Programs, which give them the opportunity to engage with Australian students, other international students and the community. The program is designed to enhance the students Australian experience and offer opportunities to apply English skills in real world situations. Rolling Orientation Program At the University of Newcastle we understand that it takes longer than one day to settle in to a new country and learning environment. That is why we run a unique three week rolling orientation program that involves a range of activities including a Meet n Greet with Australian students on day one, followed by a range of activities in your first few weeks to help with your transition into Australian life including: Living in Newcastle, Australia presentation by Australian Lifeguards Campus safety information and introduction to Student Associations over BBQ Lunch Traditional Aboriginal Welcome to Country and Cultural Program Speed Conversation sessions Our Speed Conversation sessions are a weekly activity designed to engage both the Language Centre students and other University students in casual conversation, building friendships across different cultures. International Friendship program This program gives students the opportunity to meet local Australian students and build relationships through regular out-of-class activities at local Newcastle attractions, for example: a day out at the Newcastle Museum, a picnic lunch on the Foreshore, visits to the Farmers Market, a tour of Nobbys Lighthouse. Volunteering and Work Experience program During their study students are strongly encouraged to participate in a range of volunteer and work experience opportunities. Such experiences can include our 20-hour conservation volunteer program or volunteering at local events and festivals and much more! 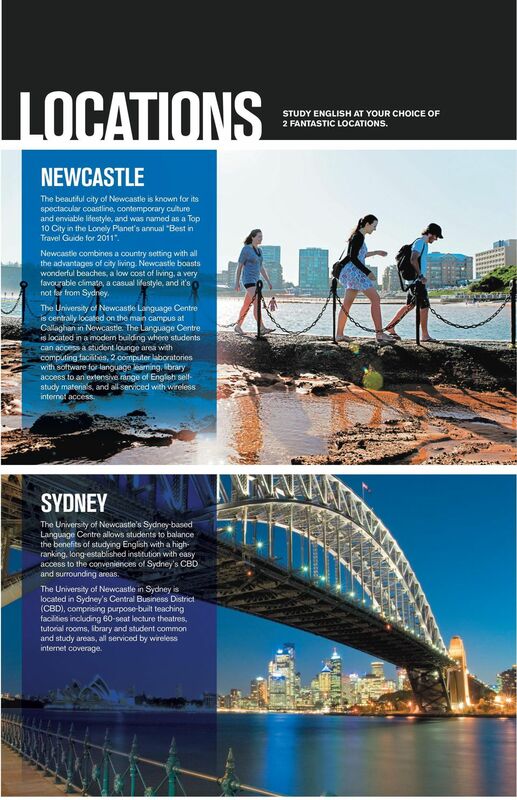 4 OF NEWCASTLE THE UNIVERSITY The University of Newcastle is a comprehensive international university ranked in the top 10 of Australian research universities, and offers a high-quality academic experience. We have a student population of more than 35,500, including over 7,800 international students from more than 80 countries. We offer a wide range of undergraduate and postgraduate programs through our five faculties: Business and Law Education and Arts Engineering and Built Environment Health and Medicine Science and Information Technology. OUR RANKINGS QS Stars overall maximum rating of five stars Ranked in Australia s top 10 universities for research income Ranked in the top 3% of universities in the world Times Higher Education World University Rankings 2013 and QS World University Rankings 2013 Ranked in the top 50 universities in the world under 50 years of age Times Higher Education World University Rankings 100 under 50 and QS World University Rankings Top 50 under Student Testimonial Saori From: Japan Present: ELICOS Future: University studies in linguistics The ELICOS teachers are very kind and helpful, and the campus is so green and full of birds it s a relaxing place to study. 5 Locations Newcastle The beautiful city of Newcastle is known for its spectacular coastline, contemporary culture and enviable lifestyle, and was named as a Top 10 City in the Lonely Planet s annual Best in Travel Guide for Newcastle combines a country setting with all the advantages of city living. Newcastle boasts wonderful beaches, a low cost of living, a very favourable climate, a casual lifestyle, and it s not far from Sydney. The University of Newcastle Language Centre is centrally located on the main campus at Callaghan in Newcastle. The Language Centre is located in a modern building where students can access a student lounge area with computing facilities, 2 computer laboratories with software for language learning, library access to an extensive range of English selfstudy materials, and all serviced with wireless internet access. Sydney The University of Newcastle s Sydney-based Language Centre allows students to balance the benefits of studying English with a highranking, long-established institution with easy access to the conveniences of Sydney s CBD and surrounding areas. The University of Newcastle in Sydney is located in Sydney s Central Business District (CBD), comprising purpose-built teaching facilities including 60-seat lecture theatres, tutorial rooms, library and student common and study areas, all serviced by wireless internet coverage. 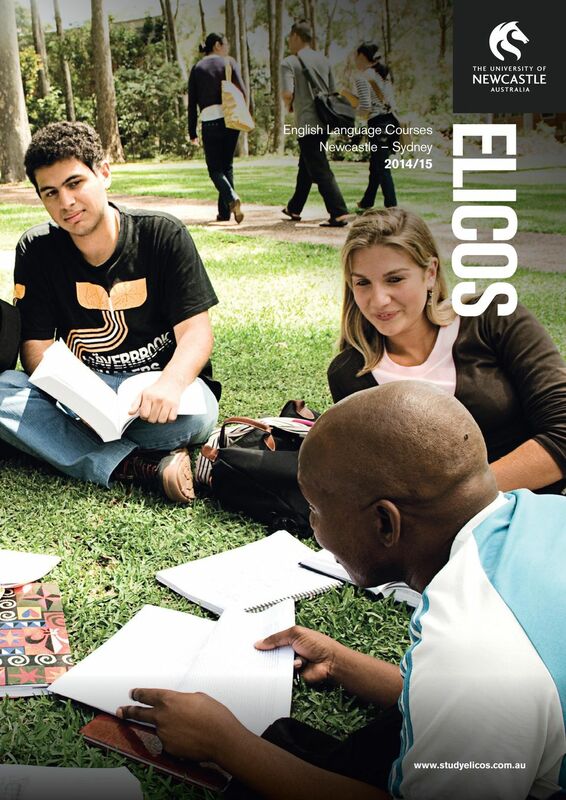 Study English at your choice of 2 fantastic locations. raphic esign athway graphic design Why choose Design at Central? WHAT S NEXT? CONNECT: POSTGRADUATE COURSE DIRECTORY Postgraduate Study at UOW Postgraduate study at the University of Wollongong (UOW) will give you an edge over others in your field even before you graduate. Postgraduate Information Evening Professor Chris Davison Head of School School of Education About us Established in 1960. A research intensive school within the Faculty of Arts and Social Sciences at UNSW. BA (HONS) FASHION DESIGN TOP UP DIRECT ENTRY INTO YEAR 3 BA (HONS) FASHION DESIGN WHAT TO EXPECT The BA (Hons) Fashion Design course is designed to prepare you for an exciting career in the fashion industry.